Help WJFF reach our $55,000 goal! Gather with your Sullivan County & NE PA neighbors to support community radio. 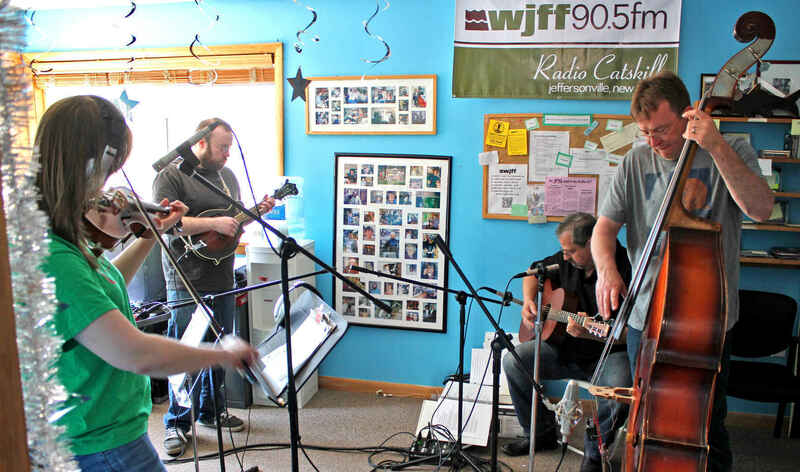 WJFF's Annual Spring Gathering Fund Drive is here! The Spring Gathering fund drive is coming, starting Friday, March 29, and we need your pledges to make it a success. This is the year we have all been waiting for - the 50th anniversary of a festival of peace, love and music that defined a generation. Whether you were there, or wish you were there, you know the spirit of that gathering still resonates here at WJFF Radio Catskill. In Woodstock's 50th Anniversary year, honor the festival's joy with a gift to your community radio station. Just as WJFF gathers Sullivan County and NE Pennsylvania community voices together for the unique mix of radio programming you love, your challenge pledge gathers your friends and neighbors together for Radio Catskill. The Spring Gathering fund drive is also a "fun" drive. True to the spirit of Woodstock, our annual Spring Gathering big music weekend portion of the drive (April 5–7) will return. Expect music, spoken arts and even a discussion panel or two all taking place right here, live on Radio Catskill. Whether yours is a one-time gift or you decide to become a monthly Sound Supporter, we are grateful for your generosity to WJFF Radio Catskill. I love hearing my fellow & sister poets on air! Thanks for the great programing! Love streaming from wherever I happen to find myself in the word. Love the station, listen to it almost every day - NPR, Ballads and Banjos, Millennium of Music, Harmonia and Wagonload of Monkeys - Super! Love hearing Democracy Now on WJFF. Thank you. I'm especially grateful for WJFF's support of poetry, with Along the Poet's Row and Poetry First Sundays! Love wjff. There is always something interesting, fun or educational to listen to. I especially love listening to the BBC when I wake up in the middle of the night! Thank you for all the great Radio!